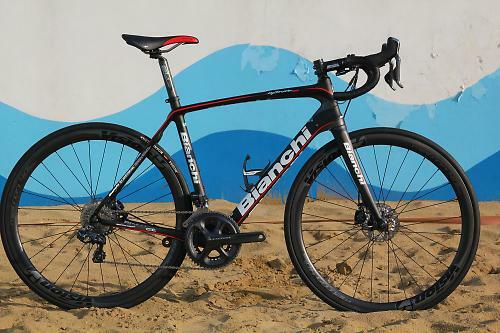 Bianchi have embraced the future by giving their highly regarded Infinito CV a disc brake makeover. The result is an impressively capable bike providing all the benefits of disc brakes with the same silky smoothness and ride performance of last year's road.cc Bike of the Year winner. It's not cheap though and neither is it very light. With a longer wheelbase and taller head tube than an out-and-out race bikes, the Infinito CV Disc is a bike for going the distance, for long days in the saddle when comfort is a priority over speed. Bianchi's Coast 2 Coast (C2C) geometry means the Infinito CV Disc has a 2cm taller head tube than their Oltre XR2 race bike - it's 17cm on this 55cm frame. The wheelbase is longer at 100.2cm. It's a geometry that toes the line between race bikes and more relaxed sportive bikes, providing a position that will appeal to those that still want to get reasonably low and stretched. Handling balance is spot-on, with good reactions through the corners and solid stability at higher speeds. Direction changes don't come with the same immediacy as you'd expect from a race bike, but it is far more forgiving when the pace heats up, especially through fast corners. 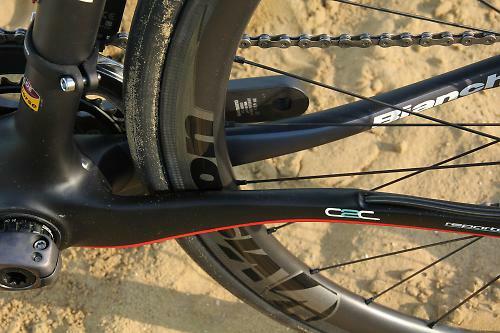 And when the road gets rough the Infinito CV Disc remains stable and composed. Despite the changes to account for the disc brakes, the Infinito CV Disc offers the same exquisite balance of smoothness and stiffness as the regular Infinito CV. The Vision wheels provide a touch more stiffness than the Fulcrum tubular wheels on the regular Infinito CV I tested last year, but the difference is very slight. The main thing to take away here is that the Infinito CV Disc offers a very smooth ride when the road surface gets rough and broken. On the scales the Bianchi weighs 8.2kg. That's not exactly heavy; it's in the ballpark for a carbon fibre bike with an Ultegra Di2 disc build, and much of the weight difference compared to the Infinito I tested last year will be down to the difference in the groupsets and wheels. Compared to similar specced bikes the weight is on the money. However compared to non-disc bikes at this price the Infinito CV Disc does look heavy, and for anyone placing a lot of importance on weight, this might be a concern. I didn't find the weight a huge issue when riding the Infinito CV Disc, even on some of the longer climbs around Riccione in Italy and up some of the Cotswolds steepest ascents. If you want a lighter option, then at present a hydraulic disc bike probably isn't for you. 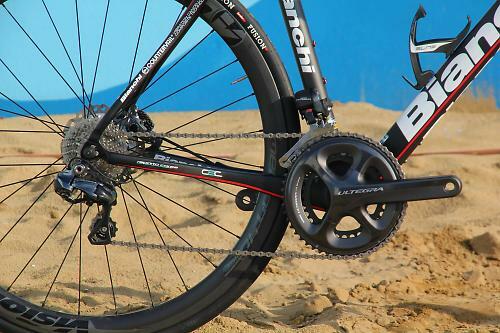 Disc brakes on road bikes are a controversial technology at present. Bianchi offers the Infinito with a choice of brakes so you can take your pick, depending on your preference. You'll know if you want disc brakes or not, and if you do the Infinito CV Disc integrates Shimano's R785 disc brakes very well, with internal hose routing and the use of Shimano's recommended 140mm rotors (160mm rotors can be used with adaptors) used on Shimano hubs laced to Vision Metron 40 carbon fibre clincher rims. Shimano's R785 hydraulic disc brakes (/content/review/114970-shimano-br-r785-road-hydraulic-discs) are the current benchmark. We've yet to thoroughly test SRAM's revamped hydraulic discs to see how they compare. Much has been written about Shimano's brakes previously. Suffice to say, performance is highly impressive. Lever action is firm with good feel in all situations. Decent modulation makes it really easy to feed in just the right amount of braking power for any given situation, from high speed braking to slow speed adjustments. The Shimano discs are most impressive when descending mountain roads with tight hairpins requiring heavy braking to scrub off a lot of speed in a short space of time. Compared to riding the same descents on carbon fibre clinchers with regular rim brakes, there really is no comparison, the disc brakes are far better. They simply provide more confidence in being able to slow down when approaching a corner that requires you halving your speed before you turn in. I had no issues with overheating during some of the longer and faster descents on the Italian roads used to test the Bianchi, nor any concerns with an excess of braking power forcing lockups. There was also no brake rub during general use. However, there was a small amount of brake rub from the front brake during out of saddle climbing. It's not enough to measurably slow your progress, but the sound is annoying. Clearly the fork isn't stiff enough, despite Bianchi having developed a new one for this bike. Would a thru-axle boost stiffness enough to resist the small amount of twist that is exhibited in this fork? Probably, but without trying such a fork in this frame it's difficult to say for certain. The Infinito CV Disc frame carries all the same styling cues as the non-disc Infinito but there are a few changes. More carbon fibre has been added in key places, in the stays, to handle the forces generated by the disc brakes, and in the new fork too. While the new fork looks the same, is has the hydraulic hose routed inside the left leg - the frame also features internal brake hose routing. It's all very nearly done, and the frame is compatible with mechanical groupsets as well - Bianchi will offer an Ultegra mechanical build of this bike. Post mounts are used at the fork and in the rear triangle for mounting the Shimano disc calipers and regular quick release axles are used, with rear wheel spacing the now standard 135mm. Under the paint the new disc frame utilises the same CounterVail Vibration Cancelling Composite Technology. This is a viscoelastic material within the carbon fibre that aims to dampen vibrations caused from riding over rough roads. As I found with the regular Infinito CV, it's a technology that works well and in the the disc version has lost none of the smoothness. Rough roads, from rippled tarmac to cracked roads highlight the Infinito's ability to filter out the harsh vibrations and provide an impressively smooth ride. Shimano Ultegra Di2 really needs no explanation, in fact you could just read my review of it here. An 11-speed groupset, with the compact 50/34 chainset providing a good spread of low gears in combination with an 11-28t cassette. The frame has internal wire routing and the battery is concealed inside the seatpost. The bike gets an FSA and Vision build. Vision supply the Metron 40 Disc carbon fibre clincher rims laced to Shimano CX75 disc hubs. The Vision rims, as their name suggests, are 40mm deep and have a fashionably wide profile. They're fast wheels and cope well in blustery wind conditions with very good stability. The wide rims provide a good base for the 25mm Hutchinson Fusion 3 tyres that come fitted, with a smooth transition from rim to tyre. The tyres provide good grip and at 100psi good bump absorption over a variety of road surfaces, with good rolling resistance too. 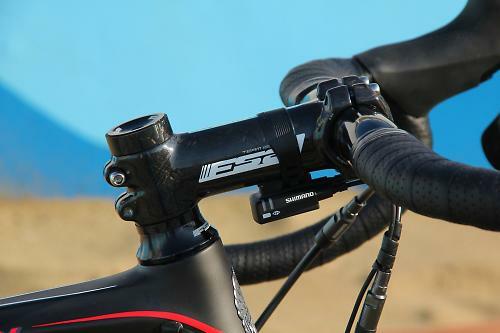 FSA's Wing Compact handlebar is made from aluminium and the short reach and drop is comfortable and makes it easy to ride in the drops for extended periods. An FSA Team Issue carbon stem and SL-K carbon seatpost complete the build. The Fizik Aliante Gamma saddle is as comfortable as we've come to expect from the Italian company. Considering the price of the bike we might reasonably expect some slightly higher grade components, particularly a carbon fibre handlebar. The Infinito offers a good balance between high speed performance and long distance ride comfort, with engaging handling for the more enthusiastic cyclists. It might not be as light as some other bikes at this price, but it's not exactly heavy and for many the benefits of the disc brakes will outweigh the small weight penalty. 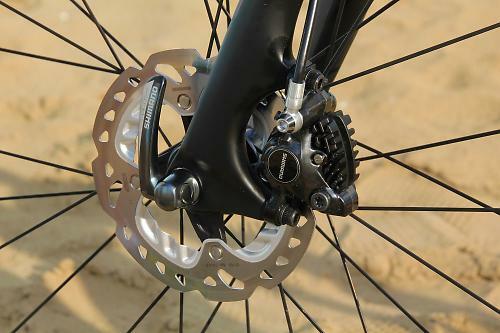 Apart from a small amount of brake rub when out of the saddle, the disc brakes provide compelling performance in all situations that really makes it hard to ga back to a regular non-disc bike. That just leaves the price. £5,600 is a lot of money, and is brought sharply into focus when compared to the similarly specced Orbea Avant I tested earlier this year: it costs £1,150 less. There's a big difference in wheels though, the Avant's Shimano RX31 wheels compared to the Bianchi's Vision Metron 40 wheels which have a list price of about £1,500. It's a serious upgrade and the wheels do have a positive impact, and the Bianchi edges the Orbea on performance and ride smoothness too. New for this season and designed to cover long distances with maximum performance/minimum stress. All thanks to Bianchi's special frame design/geometry and different material combination. This carbon frame is constructed using Countervail ; a cutting edge composite material used in the aerospace industry. Used exclusively in the world of cycling by Bianchi. Suitable for those demanding a high performance bike and tested under racing conditions in a UCI World Tour Classic. Equipped with Shimano Ultegra Di2 groupset and new hydraulic disc brakes with Vision Metron 40 full carbon clincher wheels. Bianchi collaborated with Materials Sciences Corp. to develop their innovative and exclusive application of the patented Countervail® integrated vibration canceling system for cycling. 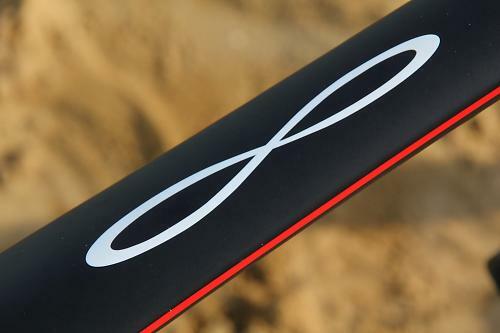 The result is the new Bianchi Infinito CV. Scientific studies prove that long term exposure to vibration, typically absorbed by the rider, causes muscle fatigue and discomfort, resulting in reduced performance. Traditional passive damping of the frame using superficial rubber inserts and isolators are only marginally effective compared to the integrated carbon Countervail® system developed by Bianchi and proven in the extreme conditions of NASA aerospace operations. 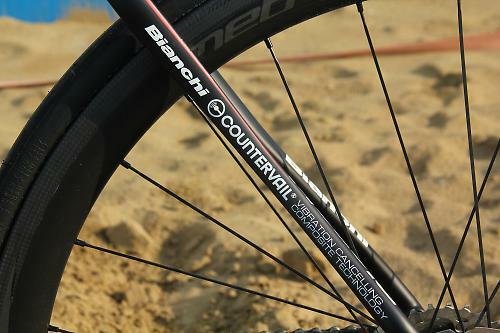 With its patented carbon fibre architecture and viscoelastic material, Countervail® carbon material is actually embedded within the unique Infinito CV carbon layup, immediately cancelling vibration while increasing the stiffness and strength of the entire frame. Racier geometry than many sportive and endurance bikes will suit racers and those wanting a reasonably stretched and low position. Swapped the stem for a 12cm and the reach was spot-on. Offers the same smoothness as the standard Infinito CV despite the changes made to account for the disc brakes. Yes plenty of stiffness when pedalling hard but the fork is lacking stiffness to prevent twist when out of the saddle. Would you consider buying the bike? Not until Bianchi address the fork stiffness. 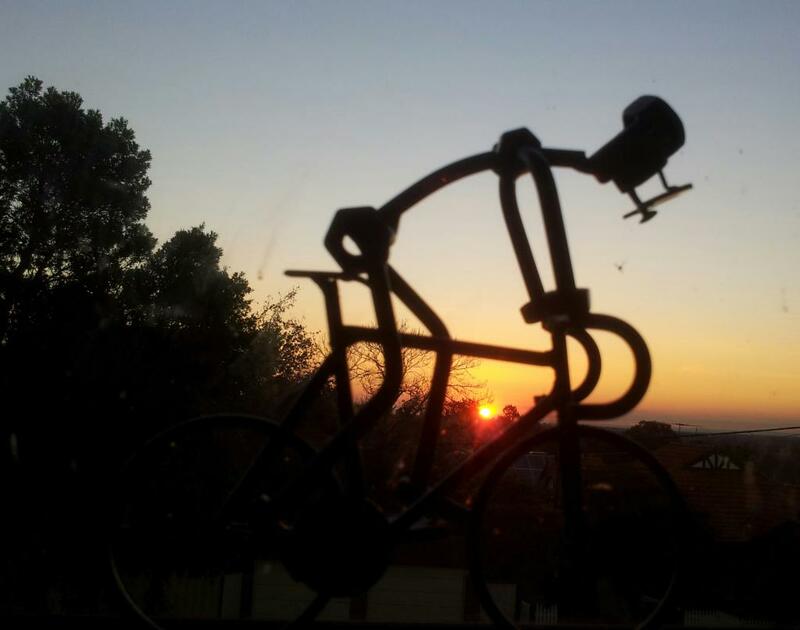 Would you recommend the bike to a friend? Maybe. Just a quick question if you would - did you try playing around with the tyre pressures and, if so, what difference it makes to the ride, grip, perceived rolling resistance etc ? 100 psi seemed quite high for a 25mm Fusion 3 on a 25.5mm rim but if the comfort was good in the UK with that then why not I guess - just curious really. Nearly 6 grand for an admittedly pretty frame with fairly average components(eg alu bar and SL-K seat post) and weighs a ton. There are much better bargains out there from some of the more bespoke manufacturers. I've had a Bianchi in the past and have always been disappointed with the kit they come supplied with. Not everyone's looking for a bargain, if I had that much to blow on a bike I'd certainly have one of these on my shortlist, I'd be happy with the groupset & the weight wouldn't bother me too much either... But it would be a tough call, especially as I do like to grab a bargain! As above, £5.6k for 8.2kg is stunning. Disc brakes add 1.2kg? Ultegra 6870 Di2 with discs = £1700 or there about. Frame off the shelf = £2800. Sounds quite a bargain to me. Nothing wrong with an Alu bar either. The difference over the non-disc version is about 1200g. On this one, the frame is about 100g heavier and the wheelset is about 250 or 450g heavier (Speed Race XLR tubs vs Metron 40 Disc tubs/clincher) - so you're maybe 30% or 45% of the way there just with those two. Whisky do a tapered through-axle road fork which combined with an Enve SES 3.4 disc wheel might fix the brake rub issue. Really burns having to fix a £6k bike with aftermarket parts though. The Colnago V1-r Disc looks like a better engineered option but is ruined by the Ferrari badges and is even more stupid money. Think I'll wait for the Focus Cayo Disc. Shame it's so ugly. "Apart from a small amount of brake rub when out of the saddle"
I guess I'll remember to ask in the shop "is the frame flexible enough to give brake rub?" If you are paying 1700 quid for 6870 you're doing it wrong. That said, given how rare (relatively) frames that can take a hydraulic groupset are, it is probably quite hard to track down the hydraulic brifters at 'normal' prices. Almost nowhere sensible charges Shimano's RRP for their groupsets. Actual sales pricing usually hovers close to 50% of Shimano RRPs. Bianchi as a manufacturer presumably get substantial bulk discounts too. You certainly wouldn't buy this because you thought the specsheet alone represented good value. You would normally expect the price of a complete anything to cost less than buying separately at retail prices. i wont be touching a disc specced bike anytime soon. nothing to do with dont like change or anything like that but i firmly believe that bolt through will arrive very soon and that should complete the evolution and remove the final issue of brake rub. I agree. I'm waiting for the through-axle revolution to really herald the disc brake revolution. I also think it would be sillyto buy a disc equipped road bike that doesn't have thru-axles. Only need to watch what happened in the mountain bike industry. I have bolt through on my mtb bike and quick release on my Boardman. I am probably devoid of all sensation but the Boardman doesn't seem to exhibit any flex I can discern.